"We're thrilled to release our very first Budge Games title centred on the iconic Transformers Autobot, Bumblebee, for the world to enjoy"
Eight years ago, in 2010, as the iPad was set to launch, our founders had a hunch that apps for kids could become the next big thing on the App Store. Since then, we've been determined to create amazing experiences for children that engage both their hearts and minds. With Budge's 50 apps now downloaded over 750 million times all over the world, we've achieved more than we possibly could have imagined. Based in Montreal, we're now over 100 passionate "Budgers" developing apps featuring some of the most popular kids' brands, as well as fresh original titles. Over the years, we've received amazing feedback from families telling us how Budge apps provided them with endless hours of fun. Some parents shyly admitting they were enjoying our apps, even when their kids were not around. Many of our fans have now grown into their teens, and they look back at our apps as a memorable part of their childhood. In that spirit, today we officially launch Budge Games (BG), a brand new division that will launch games the whole family can enjoy. BG is made possible through more than two dozen dedicated Budgers in Montreal who worked tirelessly on our very first release! We're fortunate enough to work with one of the most successful and popular franchises in pop culture: Hasbro's Transformers. 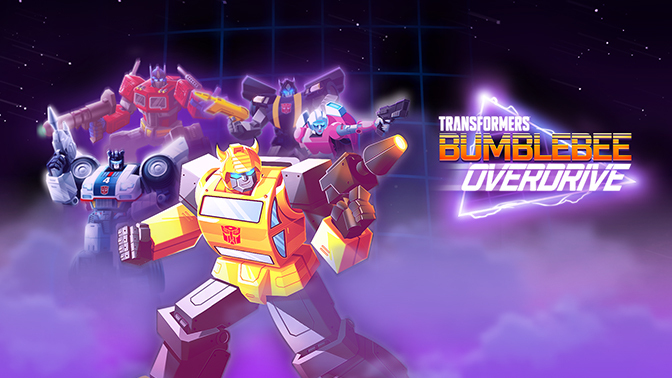 We're proud to announce that Budge Games will release Transformers Bumblebee Overdrive, right in time for the blockbuster movie's release this holiday. "Establishing Budge Games within Budge Studios in Montreal was a no-brainer for us," said David Lipes, co-CEO, Budge Studios. "The video game talent in Quebec is rich and our teams have helped us grow our business from a founding team of three to now more than 100 Budgers strong. We're extremely proud of creating apps that all ages love right here in Canada." "We're thrilled to release our very first Budge Games title centred on the iconic Transformers Autobot, Bumblebee, for the world to enjoy," added Michael Elman, co-CEO, Budge Studios. "Transformers Bumblebee Overdrive was crafted entirely in Montreal by our talented new Budge Games team." Transformers Bumblebee Overdrive has it all: Action, challenges, racing, battles, and is incredibly easy to pick up and play. You can download Transformers Bumblebee Overdrive exclusively on the App Store for 1 week today for iPhone and iPad. We hope you enjoy it, and can't wait for you to try the many exciting titles Budge Games is working on.